Sometimes I overlook sharing recipes for the basic dishes I cook every week, even though one of you fabulous readers could surely put it to good use in your kitchen. The same is apparently true of the places I eat out most frequently. A reader asked me for a list of restaurants where I eat most frequently in Kansas City and in compiling a list of blog posts to share with her, I realized I have never shared Cafe Gratitude KC. 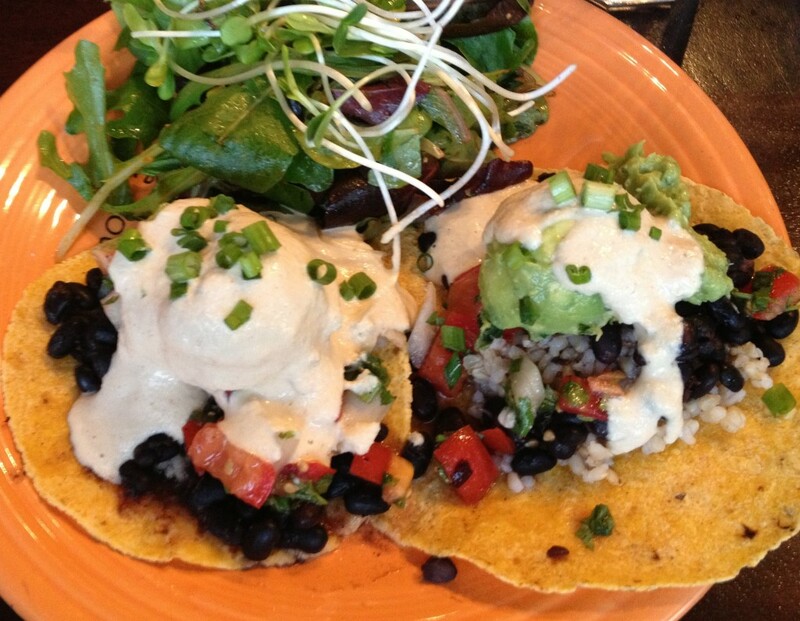 I often share photos of what I’m eating at Cafe Gratitude on Instagram. Just last week Shirley teased me that I go there so often, they should have a reserved seat for me. And they kind of do, but not just for me. There’s a seat for everyone at Cafe G, everyone is welcome, come as you are, let them nourish you. So I know this sounds hippie dippie, crunchy, typical of my Pollyanna thinking, but it’s true at Cafe Gratitude KC. You’ll eat a delicious plant-based meal, they’ll pay attention to your dietary restrictions, you can count on produce being locally sourced as much as possible, the food will for sure be vegan without fake-meat-soy, you won’t leave hungry and every single dessert is gluten-free. Read that last little part again. Yes, every single dessert is edible by folks like me. 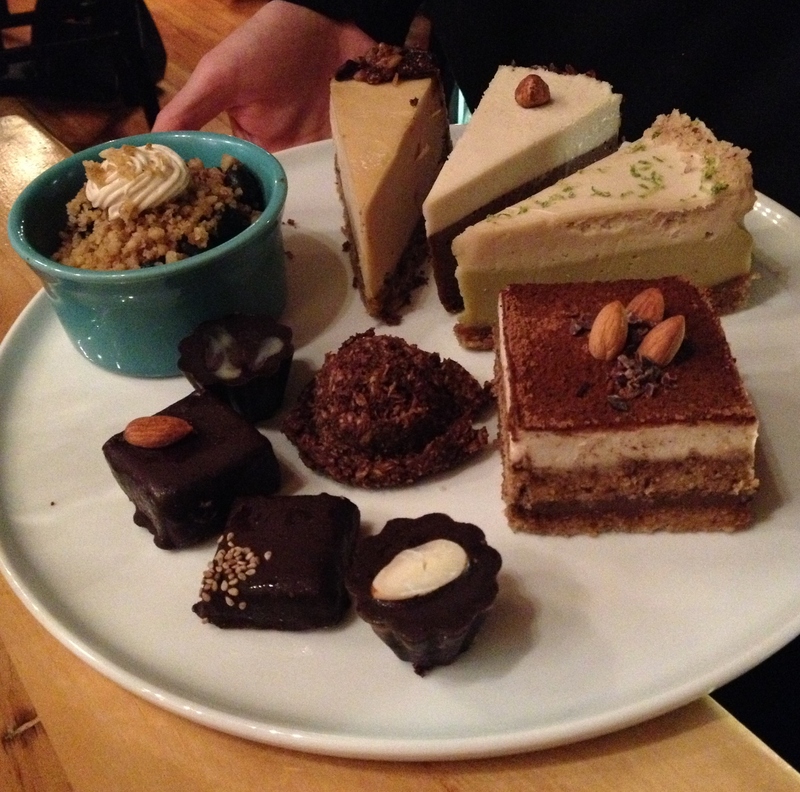 I have given serious consideration to buying the entire dessert platter when they bring it around. Because I can. This happens pretty much nowhere else for me. Feel me, fellow gluten-free folks? While they haven’t been open in Kansas City a year yet, it kind of feels like a cornerstone of the community to me. Last year my favorite fella and I had fun seeing how many different people we could share a meal with at Cafe Gratitude. 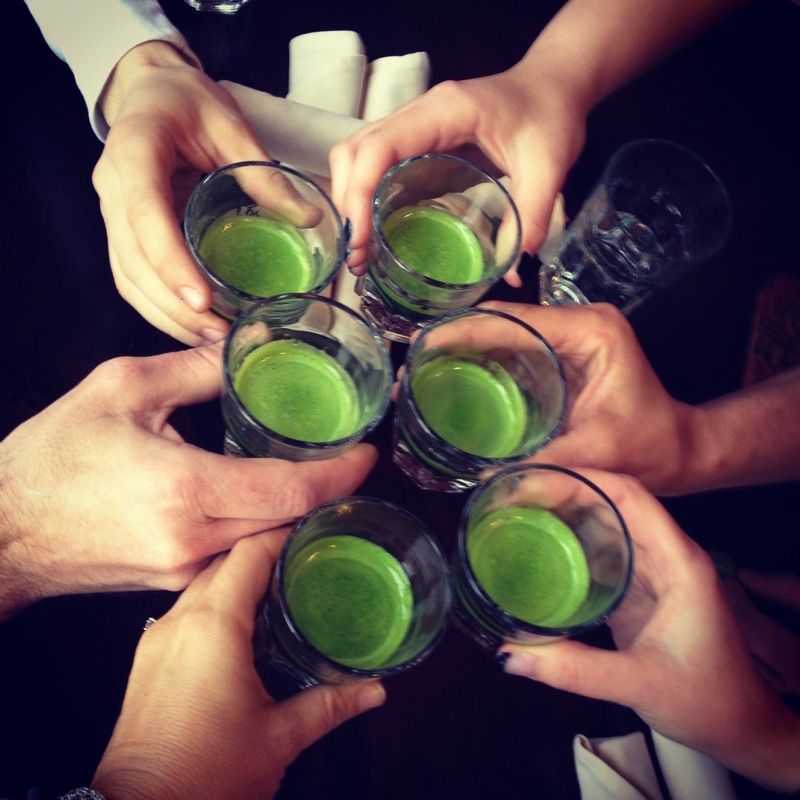 The year ended with a wonderful New Year’s Eve meal at Cafe Gratitude, shared with dear friends who pushed us over 40 friends who shared a meal with us the first year Cafe Gratitude was open in KC. I’ve bumped into a couple of celebrities there, Jason Mraz and Mike Farrell, B.J. Hunnicutt for MASH fans. I’ve seen guys in construction gear wearing hard helmets eating a plant-strong lunch, I’ve seen society ladies all dolled up heading to something at the Kauffman PAC after dinner. Really, everyone is welcome and well-fed here. Sometimes I go to Cafe Gratitude just for juice. It’s all organic and pressed with a ginormous hydraulic press, described by a server as the size of a car. Whether it is the size of a Fiat or a Hummer, I don’t know. I just know the juices are terrific. 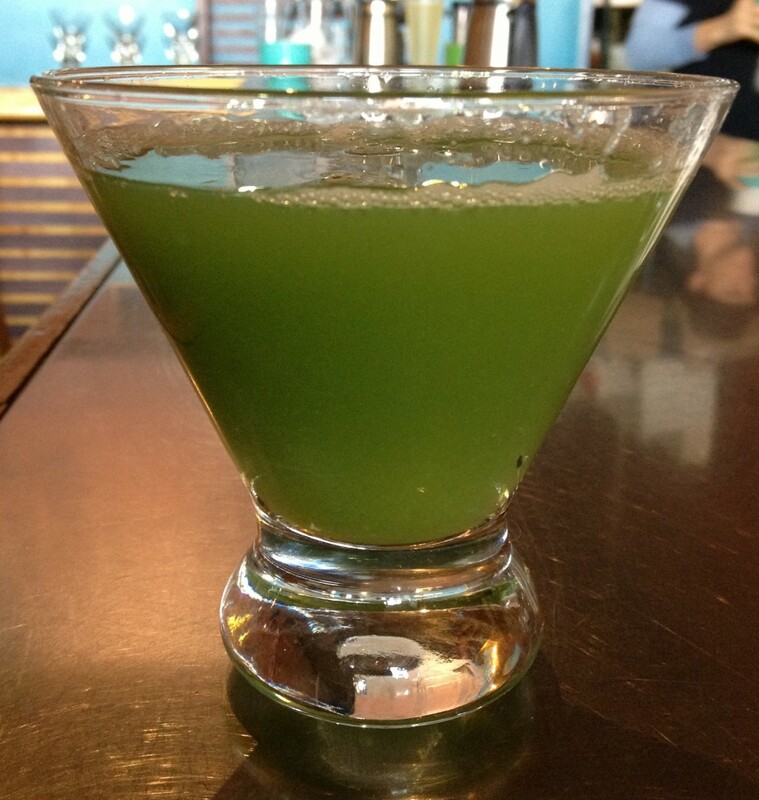 My favorite is I Am Healthy, which is kale, celery, cucumber and lemon. 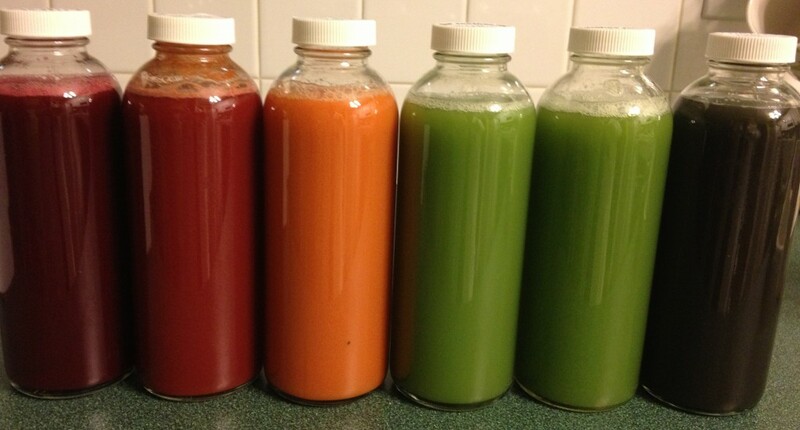 You can even buy a juice cleanse from them, six bottles of goodness a day! There’s plenty of great food beyond the juice and desserts, too. I like the tacos, a dish named I Am Transformed. Each dish is delivered with an affirmation, such as “You Are Transformed.” The tacos are filled with black beans, brown rice, guacamole, salsa fresca and spicy cashew nacho cheese. My absolute favorite is the I Am Extraordinary, a coconut-bacon lettuce and tomato sandwich. 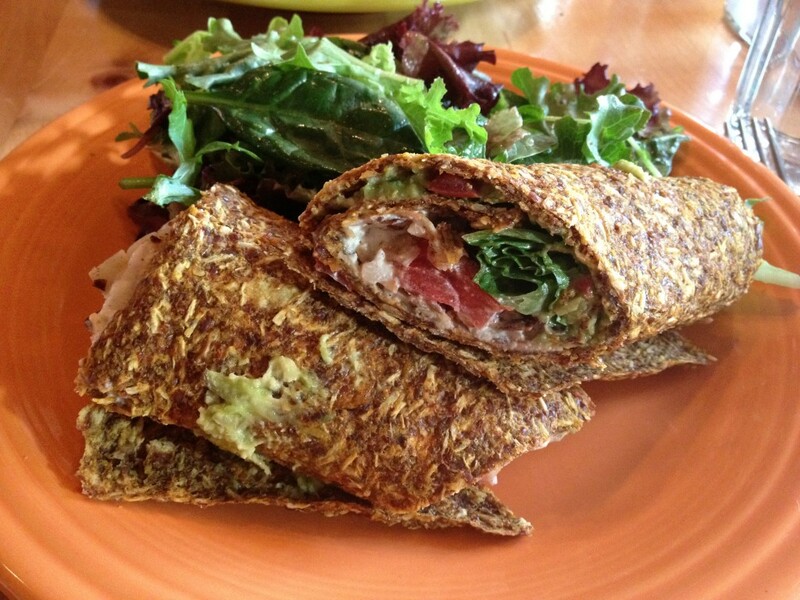 To make it gluten-free, I get it served on the apple curry wrap. It’s got a spicy kick and that perfect smoky bacon flavor that makes me crave their coconut bacon. The wonderful #BlogKC group I belong to had a holiday gathering at Cafe Gratitude and they created a special tasting menu for us. We sampled three of their dinner dishes, I Am Humble (a curried lentil dish), I Am Whole (a Macrobiotic bowl with sea veggies) and I Am Grateful. 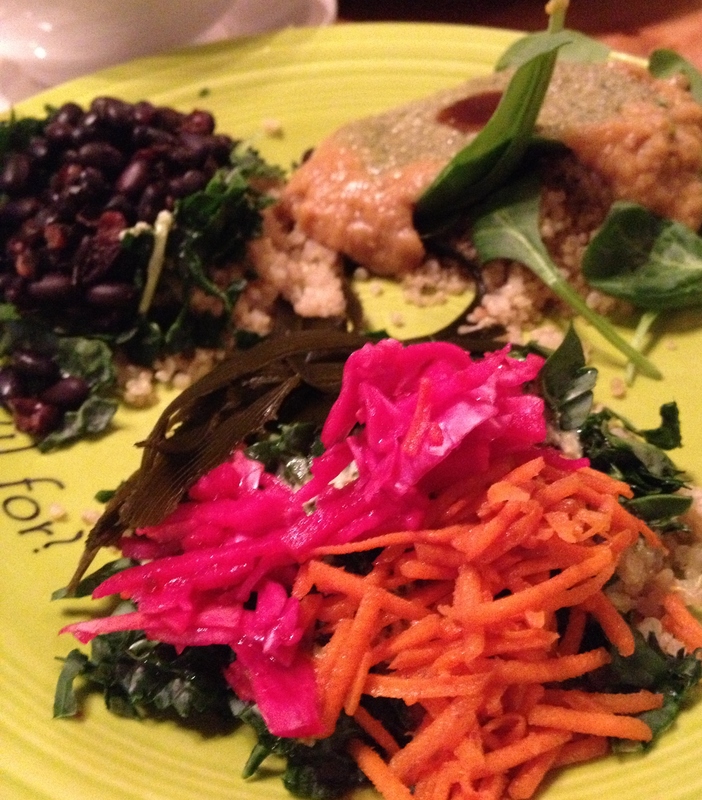 I Am Grateful is a bowl of shredded kale, black beans, quinoa and a garlic-tahini sauce. This dish warms my heart, not just my tummy. See, you can have the I Am Grateful bowl at whatever price you can pay. And if you can pay more than the price, you can pay it forward for someone else. I’ve sampled several other dishes as well, including the nachos, the tamale, a hefty spoonful of my fella’s chili recently. I’ve never had a dish there that I wouldn’t eat again. When I shared a meal with Valerie of City.Life.Eats, I fell in love with the kimchi atop the I Am Whole, a dish I wouldn’t have ordered on my own but could share with a friend because there are no worrisome ingredients. (Check out Valerie’s post for even more photos of the amazing food!) 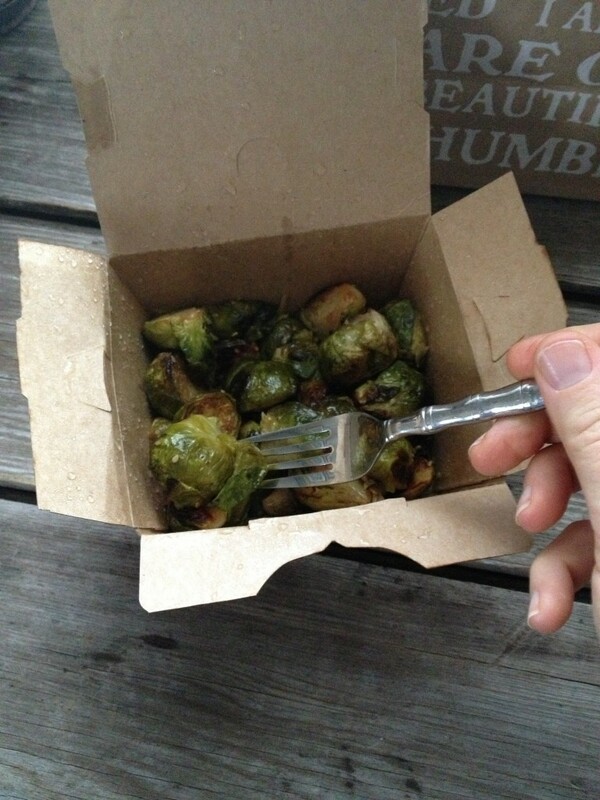 Recently my doorbell rang and it was Mendy of Fit by Burn with a carryout order of Brussels Sprouts for me. I know of no other restaurant boxing up cruciferous goodness like this, enabling us healthy and somewhat restricted eaters to re-join the community in the joy of shared food. I’m grateful to once again be able to share a meal or a surprise treat from a friend. I’m glad it isn’t a thing of the past for me, this is “breaking bread” reinvented. 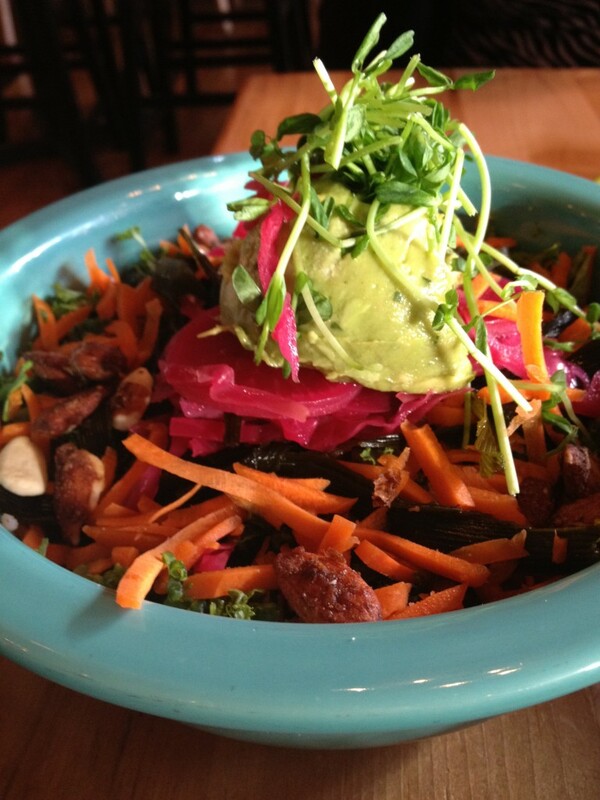 The scoop on being gluten-free at Cafe Gratitude is a short, easy one. The menu is clearly labeled. Maybe two or three dishes contain gluten. If you want something that isn’t labeled gluten-free, ask your server if it can be modified. I haven’t been told no yet. I’ve also never been gluten’d there. That alone is reason enough for me to dine there frequently. A few other things you might want to know about Cafe Gratitude KC: they have a farm in Edgerton, Kansas, where much of their produce is grown. They offer a free community meal on Thanksgiving. Parking is on the street, but if it’s full, don’t park in the paid lot, go around the block and park in the garage on 22nd street at Northwestern. They will validate for you. If you are there on a the weekend, drop into Thistle, the cute vintage store next door. Cafe Gratitude KC is located at 333 Southwest Blvd. in Kansas City, MO. 816.474.LOVE. EAT WITH: wild abandon! This is one of the restaurants I feel most comfortable being served a dish that is gluten-free. The staff is knowledgable and empowered, ask away and they’ll make it right for you. Wow! This sounds like a great restaurant. Wish we had something like it here in the Phoenix area. the food sounds wonderful. It really is wonderful food! I haven’t explored much of Phoenix, where do you like to eat there?